My experience in fleet warfare is mainly limited to the days when Factional Warfare started. The FCs indeed did get shot at first. Factional Warfare those days was a somewhat tight club and it was well known who the FCs were in most big skirmishes. If I remember well, most flew around in something agile and nimble or order to try to not get caught or a very heavily tanked battleship. I might have seen a damnation, but those were expensive ;). So do we really need an FC ship ? There are already options, but in big fleet battles once you’re the primary target probably no amount of tank would help. Maybe some sort of ship that has a siege mode, which will mean huge resistances, but no mobility and no offence ? The flagship suggested in this BB is kind of like drawing a big Bull’s Eye on one ship in your fleet and waving a flag while screaming ‘Shoot me Shoot me’. Now if we think outside the box a little, it would be cool if the FC could co pilot or even be a passenger on one of the other ships and concentrate on his FCing from there. Sort of like the Star Trek Bridge ;). I am afraid in order to do that, the game would need some rewriting in order to make this feasible. Another option, though not as cool as the above one, would be to simply remove the names and give them more generic names in order to still be able to call targets. Not my idea, but I think I read that in one of the other responses to this BB. Of course there are in game targeting tools as well, but they might be laggy in case of a large scale battle. Anyway, there are some option to tackle this problem, I don’t think the ‘flagship’ one is the best one though. Grimmash on Gaming – Blog Banter 76: Whither Flagships? A very interesting Goonwaffe post popped up today on the Eve-O forums. CCP will have to give any sort of reward system a very good thought before the bring it to the live server, since people will be manipulating the system, as you can read in this post. Giving points according to the value of the ship and cargohold of the victim is not the smartest idea. It is clever of Goonwaffe to figure out the most efficient way to manipulate the system by filling up barges and keep killing them again and again. Anyway, read it yourself at the Eve-O forum. The thread is already 13 pages long when I type this. Update: The offenders will get a slap on the wrist for exploiting the exploit before reporting it according to massively. 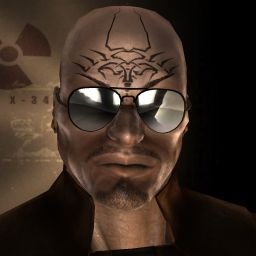 Inspired by the Eve Druid post ‘Let’s talk about lag, baby’ I decided to write something on the subject, it is the hottest topic in Eve at the moment it seems. Let me sum up the recent events first : Eve did win the european game of the year contest by the way, despite the threadnaught of, as of now, 84 pages. Most of the concerns expressed in there and in the ‘18 month hiatus’ blog was about lag. 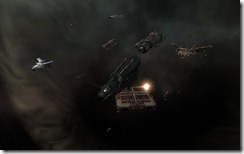 A response (of sorts) came in the form of the dev blog called The Long Lag where a plan was laid out how ccp is going to go about trying to fix the now infamous 0.0 lag. As there have been many forums posts and blog posts concerning lag, what I would like to talk about how have you actively changed your game play to avoid lag. I am not talking about tweaking to the game client or staging ships in a system before a fight, I am talking about a directly change in game play decisions to avoid lag . In my game style, in hisec, missioning exploring and what not, you don’t encounter a lot of lag. There is the odd situation where you might have some module lag in a somewhat busy mission system, but it’s been a while since I suffered from that. What I do remember and what seems to be very similar to what the current 0.0 players are experiencing, is the factional warfare ‘lag’ from about a year ago, that took quite a while to fix (investigations started early 2009). 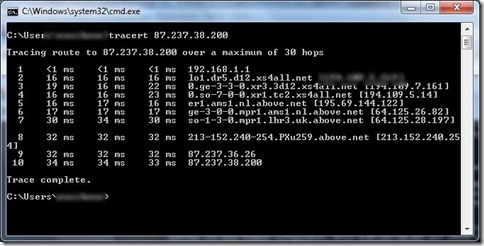 At first the problem wasn’t even acknowledged (the logs show nothing !). This wasn’t your regular ‘oh it takes 3 secs to activate my guns’ lag, that’s why I put it in quotes. When there were more than 10 people or so involved in a battle, not only would you lag, but experience complete desyncs, still being shot after podded and being in station (very odd experience that one), and stuff like that. This certainly hampered my FW-alt gameplay, I simply gave up on it. It was unplayable and very frustrating. I don’t mind loosing ships (we’re talking ruptures, vexors and rifters here), but to loose them to technical problems is very annoying to say the least. After all it turned out to be quite a complex bug and had to do with standings and such if I remember well. So it could very well be, the 0.0 issue is something similar. Let’s hope the recent mass tests and other data will result in a fix. Eve really needs this at the moment, as more of this lag monster will result in more bad press and dissatisfied customer. And the 18month development hiatus does not help people’s patience either. 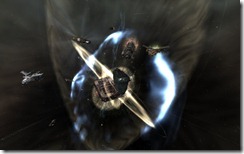 No no, not a post about busting CCP’s bunker, but one actually about gameplay. And the ‘broken’ factional warfare nevertheless. I reactivated my FW account when we got the 5 days back, and really liked the small fleet pvp again. The last two weekends the minmatar recaptured 4 systems that were previously captured by the Amarr. We had three vulnerable systems the weekend before last, and a nice bunker buster fleet came in from Auga to blow up the bunkers, assisted by a few dreads and carriers. Last weekend we had only one bunker to bust but it took a little longer as we had no capital support. Both weekends no Amarr counter fleet was formed, although they did cut off the pipe down into Minmatar lowsec, so anyone who wasn’t in a stealth bomber had a hard time coming down to help. All in all it was good fun, though the busting itself is a bit boring. It’s basically like shooting a pos. BTW the domi seen here in the screenshots was lost this weekend unfortunately ! “Everybody hold on the Amamake gate !” the FC said over the comms. 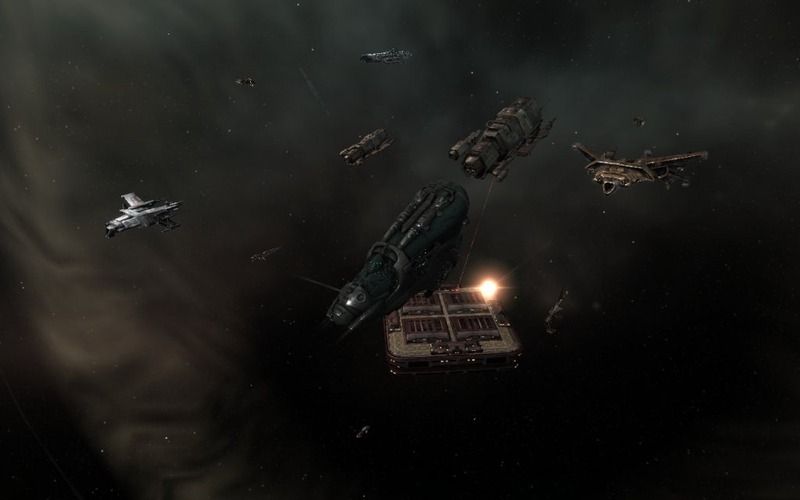 Reports of pirate activity in Amamake had come down through the intel channels and a Minmatar assault force had gathered to take care of the problem. A cloaking Hound was then set on the top belt to see what exactly the activity was. “I have a Bhaalgorn here, it’s a Bhaalgorn !” our scout excitedly shouted. A Bhaalgorn is a very rare sight. Only obtained on the black market for over a billion isk. 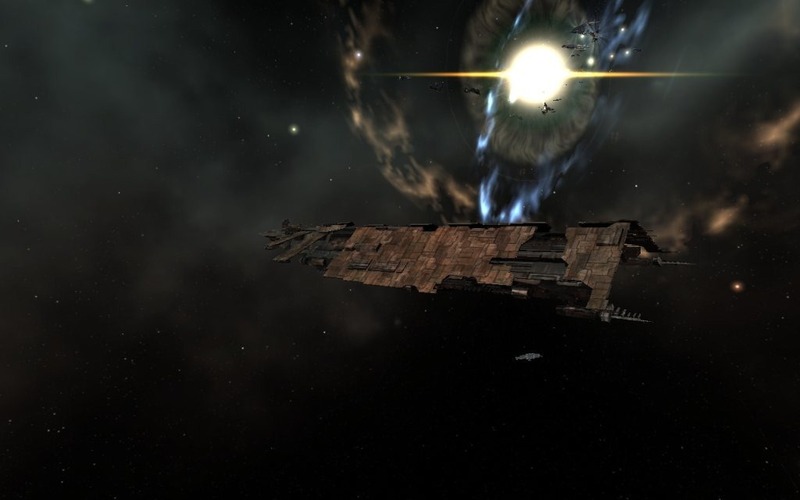 Usually fitted with very expensive modules, that are usually obtained through the same channels as the ship, they originate from killing high ranked officers of pirate/outlaw nations like the Sansha’s. “All fast tacklers go in ! All fast tacklers go in! Everybody else hold on the gate !”. The tacklers were able to get a warp scrambler on the Bhaalgorn. The rest of the ragtag minnie fleet came in and warped on top of the Bhaalgorn. The minmatar stealth bomber in the belt uncloacked and unleashed it’s torpedos, pounding on the Bhaalgorn’s shields and armor. Our ecm arrived at range on the battlefield and was able to scramble those that came to the Bhaalgorn’s aid. Slowly but surely the Bhaalgorn went down. It’s a very well tanked ship so it took what felt like ages. My Stabber rotated around the pirate’s battleship at 3000mtrs, pouring rounds and rounds of ammo into it’s armor. “ECM is down ! Ecm IS down !”. I didn’t want to hear that over the comms ! Any moment now one of the enemy ships could target me, and rip my poor stabber to pieces. If I hadn’t been in my pod, I am sure the sweat would have poured over my face. “He is down ! The Bhaalgorn went down !! !” some people shouted over the comms. But we held our composure and disposed of his helpers as well with minimal losses on our side. Certainly compared to the net worth of the Bhaalgorn. Long after the fight when things had quieted down our pilots were still cheering over this great victory. Word spread amongst the other pilots in the militia and it strengthened our hearts and souls. Posted on May 25, 2009 May 25, 2009 Author MorphisatCategories Factional WarfareTags Factional Warfare, fanfiction3 Comments on Bhaalgorn Down ! It was late last year, when I got tired of war. Of killing. Of podpilots around me being killed. Of the life of a minmatar freedom fighter. I enlisted to help my people, and to be honest some part of me also was looking for recognition. Trying to make a name for myself. After months of fighting though, I felt empty inside. We took over some systems, killed quite a few Amarr religious zealots, but still… It didn’t seem to make a difference. It was then that I decided this wasn’t the life for me. I contemplated about going back to my old job, a mammoth freighter trucker. Maybe do some missions for the Republic Fleet every now and then and use my combat skills for at least a somewhat good cause. It wasn’t an easy decision to make, but late in the fall of last year, that’s what I did. One day I silently left Dal, my war homebase and picked up my old trusty Mammoth in Rens and never looked back. Or at least that’s what I thought. And that’s when it started, the nightmares. Visions even more horrible than what I ever saw in the war. Not sure how my mind came up with those ! It started with only one a week, but it got worse as time went slowly by. Till it got to the point where I didn’t dare to go to sleep again. And during the day it was like there was a dark cloud over me. I couldn’t find any joy in whatever I did, and kept thinking of the friends I left behind. Roc Wieler, Angry Fist, Stoogie. What happened to them ? And how were they coping ? The thought that I let my people down, and betrayed my heritage kept popping up in my mind. This was not my purpose as a pod pilot ! I had to get back to Dal and back into the war. And that’s what I did. And weird enough from the moment I signed on again, the nightmares were gone. Some sort of inner peace came over me inside the turmoil of the war. I found my destiny again, and hope I will never loose it. Disclaimer: My first effort at fanfiction for Godlesswanderer’s contest, please be gentle :). The regular Eve Production life was getting a bit stale again, you can get excited about Hammerhead II sales only so many times. So to spice things up a bit I reactivated my Factional Warfare Character Q. And I must say things have changed a bit since I left in the fall of last year. 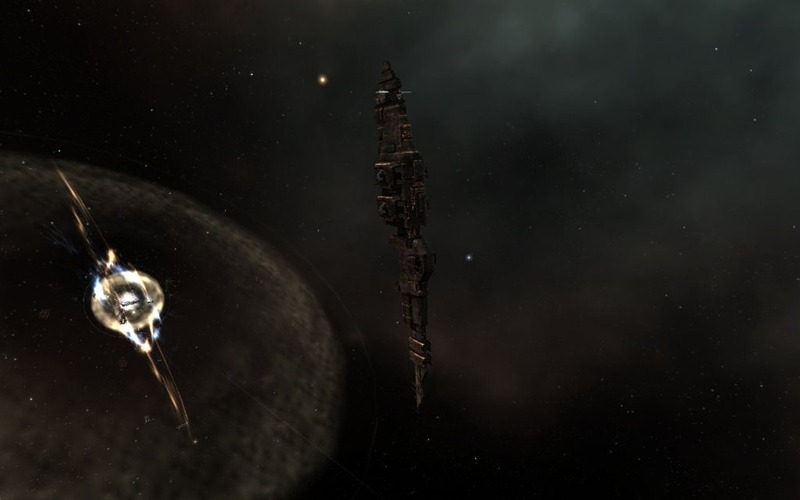 FW on the amarr – minmatar side is still pretty active. 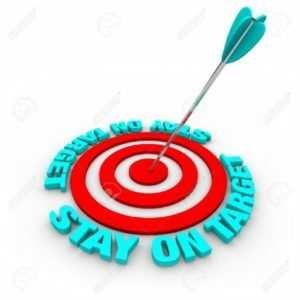 There certainly arent a lack of targets like when I left last year. The amarr put together a pretty large fleet Sunday night. It was amusing, as there were about three minnie fleets roaming around. But a few times we crossed paths and that’s when we were spotted I think. They must have thought that we were one big blob and decided to all group up. Anyway I was in a few fights over the weekend, nothing spectacular, and dodged at least one camp in my vexor. I saw some old familiar faces and quite a few new ones. Learned some new terms (I am being yellowboxed was one of ‘em). And found out that battleships are more common in FW now. Then it sort of struck me what a different game this is, compared to running a few missions and mining a few hours in an Orca. The fights are exciting. The banter on EveSpeak is amusing. Adrenaline rush when you jump into a camp and manage to loose ‘em. I am glad I took this step, it was fun to be back again, and hope it will stay that way ;). Let’s look at my eve year at the start of a new one :). Can’t quite remember what was going on at the start of the year, probably just some mining and missioning. And I started invention around the time. Mainly T2 drones, later on T2 shields. The income of that wasn’t too bad. And with the mission running that landed quite a bit of ISK. The rakeriku corp was getting a bit rusty though, and a lot of people either left or didn’t log on anymore, new leadership and some diplomatic actions got us a place in Wicked Creek to liven things up a bit. This was in April. Quite a few members logged on more and we got some new ones as well. Life in Wicked Creek was nice at first, but it got ugly pretty quickly. The novelty also wore off, as 0.0 isn’t that exciting, if you don’t pvp a whole lot. It’s good for the wallet though, made quite a bit of isk out there. Until it was too unsafe to undock and found myself spending most of my time in empire again. I think by july or so we pulled out. Haven’t kept track of the situation there at the moment, but I doubt it has improved. Missioned quite a bit after that and started to do more invention around the summer. Also my alt Qanatas joined the Factional Warfare ! 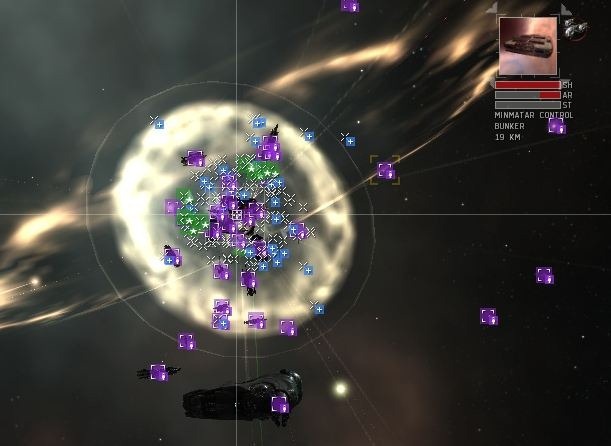 For a few months this provided quite a bit of enjoyment (general Beanflicker deserves a mention here, he setup quite a few nice fleets and was a very funny FC). Flying in fleets for the first time was interesting. Roaming about in small gangs was nice as well, somewhat more stressful as you had less people to fall back on. Fall of this year saw the definite demise of the Rakeriku corp. Just about everybody has left or stopped playing. I don’t play a whole lot any more, have the feeling at the moment that there isn’t much new I can do, and I am a bit bored with what there is. I am not interested in some pvp 0.0 corp, with obligatory mining ops etc. Have plenty of ISK so no need to mission or mine at the moment. So I am not sure what to do at the moment. Maybe tech 3 stuff will be interesting, and that should come in the march expansion. Though on CCP’s timetable it might be later. Hopefully it doesn’t need some extremely rare 0.0 components and it will be doable for regular empire dwellers as well. The wormhole exploration might be nice to do, but we’ll have to see how that game mechanic will be implemented. Lately I haven’t been very active in Factional Warfare. The whole thing got a little stale at least on the Minnie – Amarr side of things. And much to my surprise we had a huge battle that lasted for almost an hour Wednesday night. One of the most amazing things in my eve career to have been a part of. Some people died several times and came back in new ships ! I was happy to keep my rupture alive. Fitted with artillery cannons so I was able to keep a distance, dealing out some damage that way. Had to warp out several times, one time with 20% armor or so left. The official forums has a thread, but it’s a bit polluted with the standard Whine, there is a nice report on the Heretic Public board at forum.heretic-nation.com. Just as things were going a bit stale lately in the factional warfare (at least on the Minnie side), the Amarr seem to have upped their game. Whether someone finally took the lead, some new corp joined their war effort, or something else, I don’t know. But they seem to be better organised and actually engage their enemy. And last night they were busy getting their own low sec systems back. What they do now, is have battleship heavy, remote repping fleet, which is supported by ECM. It’s very hard to break for the minmatar fleet, even though we outnumber them, we usually show up in rifters and cruisers with the odd battleship. Last night we assembled a better fleet, but the whole thing was a bit disorganised, and we suffered some losses. Amarr morale was up after that fight as all of a sudden they were all over their own lowsec. I did some factional warfare missions in a small group and we were being chased around quite a bit, which was an interesting change. Only thing we lost was my kestrel, so it wasn’t too bad ;). An interesting turn of events, of course I will keep you all up to date on new developments !